So you’re planning on launching a new website. Great! Before you hire a designer and get started, there are a few things to take care of before hand. These are things that will allow you to build a solid foundation, which will make working with your designer that much easier. And when you’re designer has all the pieces they need, they can do a better job effectively designing a website for you that will get results. 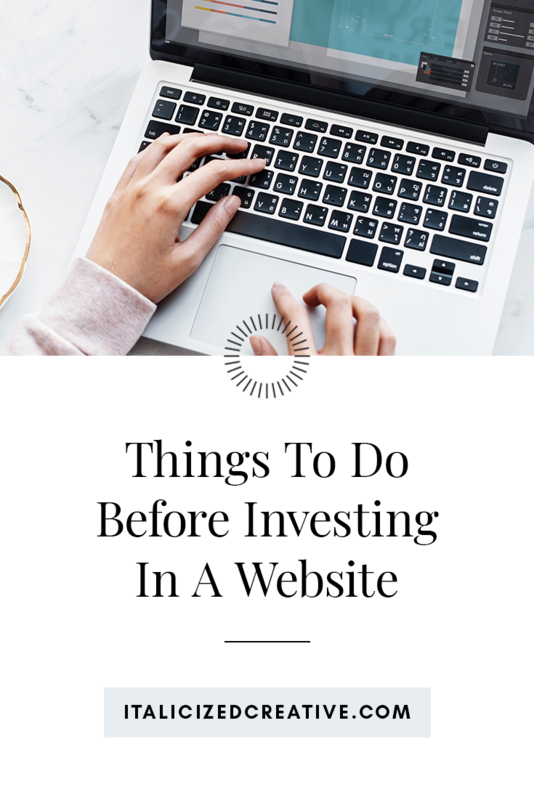 Here’s a look at a few things you’ll want to have done before investing in a new website. First things first, get crystal clear on who your audience is and what you offer them. Once you have that nailed down you can move onto understanding what your website needs to do for you. Think about why you need a website. Is it to sell products? Establish authority? Get business via Google? These are the things you need to think about. Then go a step further – what does your site need to do in order to help you achieve these goals? How are you going to ensure that these goals are met? There are a ton of website platforms out there. From WordPress to Squarespace to Shopify and everything in between. Not every platform is going to be the perfect match for you. And it’s okay if you don’t know what platform you want to be on. Your designer/developer can help you make the right choice. However, what is important is thinking about what features you’ll need. Do you need just a simple blog? How about an ecommerce solution? And don’t just think about now. Think about the future as well. Maybe your site won’t have a shop now, but if you’re planning on adding one in the next year, then that’s something to keep in mind. Also think about your comfort level. Are you capable of maintaining a more complex site? Or do you want something that is super simple to maintain? Will you be updating your site yourself or will you hire someone to take care of that for you? Think about your answers to those questions and then take a look at the various platforms out there. Which ones best fit your needs? If you’re confused, don’t worry too much about making a decision. You can always consult with a developer who can tell you which platform will be the best fit! If you don’t already have a business name, now’s the time to get one. A name is a key part of your business and your designer cannot do much if you haven’t decided on one! But beyond your business’ name, go ahead and secure your URL as well as any social media handles. Having these in your possession as early as possible will prevent any headaches in the long run. A website is only as good as the content that is loaded on it, which is why it’s incredibly important for you to start getting your content together before you invest in a website. All the content doesn’t necessarily need to be complete before your hire a designer, but you should be making progress and have some major decisions made. For example, if you’re planning on hiring a photographer for new headshots or a copywriter to write your sales page, you need to plan ahead for this. Working with these professionals takes time and your web designer will need this content sooner rather than later. So it’s important to think ahead and get the ball rolling on those tasks before you get started on your website. If you’re not hiring a copywriter, now is the time to start writing your site’s copy. Some designers (like Kelly) require content before they can design a site. Not having your content ready can delay a project (potentially costing you money) so make sure to start working on that ahead of time. When investing in a website, the more you have planned out, the better. Here are a few things that are helpful to have in place before hiring a designer, but they’re not necessary. Plan for ongoing maintenance – will you maintain the site or will you hire out? How often will you blog? Will you even blog? Before investing in a website, ultimately it comes down to really thinking things through and having a solid understanding of what your goals are and how your website will help you achieve those goals. While you may be so excited to hire a designer, it’s important to get these things squared away before hand. Otherwise you’ll be wasting your time as well as your designer’s. Plus, having everything figured out before will allow your designer and developer to best assist you with creating a website that will really work for you.